Tunnel erosion is a type of land degradation that has occurred throughout much of Victoria. However, little detailed research was published on the topic from Downes’ (1946, 1949) early work until the 1990s (e.g. Boucher 1990, 1995, 2002, 2004, Ford et al. 1993, Boucher and Powell 1994, Fitzpatrick et al. 1994). There are many factors that can influence the initiation, development and spatial distribution of tunnel erosion. The present article is a source of further information on physiographic factors affecting the tunnelling phenomenon. Costerfield is a semi-arid rural sheep grazing area located 100 km north of Melbourne, Victoria. Tunnel erosion was found on a number of hills, one of which was selected for study. The elevation of the hill ranges between 230 m and 260 m ASL. The Heathcote Post Office is the nearest Bureau of Meteorology (external link) station and is located approximately 7 km to the west of the field site. The average annual rainfall for the area is 575 mm, with most occurring between April and October. The hot, dry summers can be interrupted by high intensity rainfall resulting from electrical storms. Droughts are not uncommon. Widespread deforestation of Eucalyptus spp. forest resulted from European settlement, initially in relation to the discovery of gold in 1852. Further destruction took place from the late 1870s for the purposes of grazing and cropping. A large number of tree stumps and a sparse cover of native grasses cover the duplex soils which are subject to varying degrees of sodicity. According to ‘The Australian Soil Classification’ (Isbell 1996), the tunnelled soils varied between Kurosols, Natric Kurosols, Chromosols and Sodosols, whilst they conformed to the ‘Palexeralfs’ in the Soil Taxonomy scheme (Soil Survey Staff 1992). The underlying material consists of Silurian sandstones and mudstones. Looking towards the tunnelled hillslope stuided in the present article. Slope and tunnel segment bearings were observed from a hand-held compass. Slope steepness was measured using a ranging pole sighted through an Abney level with an accuracy of 0.5o, and the arithmetic mean of two readings (i.e. approximately 1 m above and below the chosen point) was taken as the final result. The frequency of tunnel branches was apportioned in to 22.5o slope orientation classes following the broad methodology of Hughes (1972), and the results were plotted on the arithmetic mean value of each aspect class. The 40 tunnel branches used for cross-sections (Boucher 1995) were chosen from a total of 124 readily visible branches present on the hill (Boucher 2002), and were observed to most frequently convey discharge during runoff-producing storms. The cross-sections were established as near as possible to the hillcrest in an attempt to minimise the role of tunnel piracy in influencing the orientation of the enlarged collapse features located further downslope. Most sites were located in the mid-slope segments of the hillslope where access to tunnelflow was possible without damaging each cross-section, and from which point tunnels usually extended many metres upslope. It is best to understand the following ‘frequency distribution’ diagrams as though one is looking down on the hill from above and facing north. The range of slope steepness (9o - 17o) at the cross-sections with respect to slope aspect is shown in figure 1 and it is apparent that there was no strong relation between these variables. The slope angles in this data set were somewhat higher than those for another severely tunnelled site (3o 30’ - 14o) that is located approximately 3 km away. 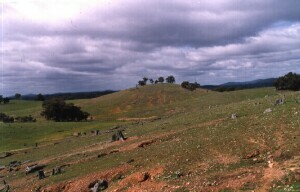 The data from these two sites are in agreement with Downes’ (1946) observation from north-eastern Victoria that the minimum slope inclination ‘required’ for tunnel initiation was approximately 4o, although slopes of about 1o have been affected in New South Wales (Newman and Phillips 1957, Crouch 1983). In the next diagram it can be seen that tunnels incised the B2 horizon at nine of the 40 cross-sections (i.e. 22.5 % of the sample) and the BC horizon at 24 sites (i.e. 60 %). In the remaining seven cases the soil was eroded only to the depth of the A horizons, four examples of which were accounted for the by the incipient tunnel exits (i.e. cross-section nos 30 - 33). These four exits, rated ‘1’ in the diagram were confined to the north-to-east quadrant of slope aspects, although it is not known how recent was their formation or how frequent their activity. This observation lends some support to Downes’ (1946) comment that tunnels were initiated on north-facing slopes following the 1914 drought in north-eastern Victoria. He speculated that the process may have been initiated on these aspects where pasture deterioration is more rapid and subsequently develop on other slope orientations following a general decline in vegetative cover. The networks on the present hill appear to be still developing, as incipient and shallow tunnels are adjacent to deeper channels. There was no pattern evident in the depth of tunnel incision from the 40 cross-sections measured, possibly because of the extensive overall erosion on the hill. Preferential flowpaths and master tunnels which respond more frequently to storms than other network branches are likely to develop through tunnel piracy. Whilst cross-section no. 19 was eroded to a shallow depth of 51 mm, and accordingly also classed as rating ‘1’ (i.e. ≤ 99 mm deep), it was well-developed, being 355 mm wide. 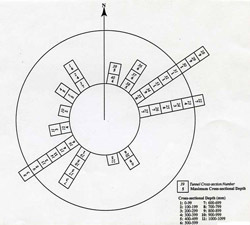 The complete ‘width and maximum depth’ data set for the 40 cross-sections as measured in 1991 is provided in a later diagram. 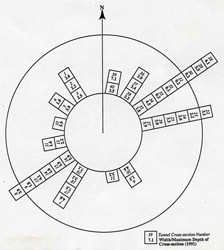 It is clear from figure 3 diagram that 31 of the 40 (i.e. 77.5 %) of the monitored cross-sections were located in the north-to-east and south-to-west quadrants of slope orientation. This distribution cannot be satisfactorily explained by the above-mentioned factors, and therefore other variables such as the dip and strike of the bedrock may be involved. The exposed bedrock on this hill comprised fractured moderately-weathered interbedded sandstone and mudstone. The strike of the bedding plane was typically about 320o - 140o (i.e. north-west to south-east) and was inclined (i.e. the dip angle) at 56oS, although the values of both parameters varied slightly around the hill. The direction of the dip/anti-dip plane, which is defined as normal to the strike, was approximately 50o - 230o (i.e. north-east to south-west). 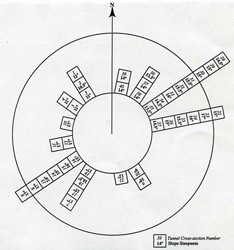 When the raw data for slope orientation of the cross-sections were apportioned into 22.5o-classes on both sides of the eight major compass bearing subdivisions, 21 of the 40 tunnel branches (i.e. 52.5 % of the sample) were aligned approximately with the dip/anti-dip plane, and a further eight branches (i.e. 20 % of the sample) with the strike of the bedrock. Thus, a clear role for geological control is evident in the spatial distribution of the 40 tunnels monitored and a possible mechanism is outlined below. Geological controls may become important when large volumes of water infiltrate into the soil and erode the nonsaline-sodic subsoil, where the accumulation of ponded water would be expected to enhance the dispersion of clay particles, producing a loss of aggregate structure and the concomitant creation of large voids deep in the profile. These cavities would act as loci to entrain percolating water from subsequent storms and also form preferred flowpaths for adjacent throughflow. The dispersed clay suspended in the ponded water will tend to shrink upon desiccation, forming cracks adjacent to the BC layer. Together with generalized tunnel incision and the presence of discontinuities such as tree roots which enhance percolation through to the bedrock, these cracks could permit flow through dip and anti-dip fractures as well as along the strike of the bedrock. The width and maximum depth of the 40 cross-sections measured are evident in the diagram in figure 4. Apart from the four incipient tunnel exits (see the Inset part of the diagram) and cross-section nos 4, 11 and 19, the width of the remaining cross-sections exceeds that of the depth of incision. The widest cross-section measured (i.e. no. 29) was approximately 4.6 m and the only cross-section exceeding 1 m in depth was no. 14 (i.e. 1.03 m). The width/maximum depth data for the 40 cross-sections are shown with respect to slope orientation in the next diagram. The ratios range between 0.1 and 7.5 for cross-section nos 32 and 17 respectively. There is no relation between the width/maximum depth and slope orientation as high ratios are present in each quadrant. It is suggested from these findings that tunnels developed laterally in the dispersive clay subsoil, rather than incising what was probably a less erodible BC horizon on that hillslope. Width and maximum depth of the 40 cross-sections re-measured in March 1992. 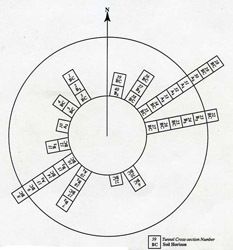 The width and maximum depth of the 40 cross-sections were re-measured 12 months after the data set derived in March 1991 and are presented in the following diagram. The sample was reduced from 40 to 32 owing to the effects of vandalism of the equipment at the cross-sections. Cross-section no. 14 increased in width by 70 mm and maximum depth was reduced by 143 mm, the latter owing to infill by sediment in transit moving along the tunnel and/ or by corrasional wall-caving. On the other hand, the cross-section no. 29 increased in width by 11 mm and maximum depth by 137 mm. Accordingly, there was a reduction in width/maximum depth from 5.5 in March 1991 to 4.7 a year later, as is seen in the next diagram. Many ratios had changed little upon the re-measuring of the cross-section. The largest increase occurred at cross-section no. 34, the ratio being 4.5 in 1991 and 9.0 after 12 months had passed. The width remained unaltered, but maximum depth was reduced by approximately 50 % from 899 mm in 1991 to 447 mm in 1992. Width and maximum depth of the 40 cross-sections re-measured in March 1992. Width/maximum depth for the 40 cross-sections measured in March 1991. With regard to assessing the roles of physiographic factors on tunnel initiation and development, there was a clear role for geological control on the hillslope as 29 of the 40 cross-sections monitored (i.e. 72.5 % of the sample) were aligned approximately with the dip/anti-dip plane and strike of the bedrock. Further evidence for this effect was gained by analysing the change in width//maximum depth at the cross-sections which were not vandalized, but for which cross-sectional perimeter could not be measured owing to overhanging soil. The relatively high width/maximum depth data for the cross-sections bear implications for tunnel development with respect to the duplex nature of the soil type, the variation in chemical characteristics of the clay fraction with increasing soil depth, and the deepest horizon which is eroded. The maximum cross-section depth for the 40 tunnel branches was found to be approximately 1 m and this is an important consideration in the development of a reclamation programme as tunnels should be destroyed completely by deep ripping prior to other measures being taken (Boucher 1990, 2002). Boucher SC (2004) Tunnel erosion. In ‘Encyclopedia of Geomorphology’. (Ed. In Chief AS Goudie) (Routledge: London) pp. 1073-1074. Boucher SC, Powell JM (1994) Gullying and tunnel erosion in Victoria. Australian Geographical Studies 32, 17-26. Crouch RJ (1983) The role of tunnel erosion in gully head progression. Journal Soil Conservation, New South Wales 39, 148-155. Downes RG (1946) Tunnelling erosion in north-eastern Victoria. Journal of the Council for Scientific and Industrial Research 19, 283-292. Downes RG (1949) A soil, land-use, and erosion survey of parts of the Counties of Moira and Delatite, Victoria. CSIRO Australia, Bulletin No. 243. Fitzpatrick RW, Boucher SC, Naidu R, Fritsch E (1994) Environmental consequences of soil sodicity. Australian Journal of Soil Research 32, 1069-1093. Ford GW, Martin JJ, Rengasamy P, Boucher SC, Ellington A (1993) Soil sodicity in Victoria. Australian Journal of Soil Research 31, 869-909. Hughes PJ (1972) Slope aspect and tunnel erosion in the loess of Banks Peninsula. Journal of Hydrology (NZ) 11, 94-98. Newman JC, Phillips JRH (1957) Tunnel erosion in the Riverina. Journal Soil Conservation, New South Wales 13, 159-169.